In the 4+ years we’ve been operating, we’ve taken many many children – aged from 4 years up – on kayak tours. double kayaks and siblings do not mix. If you want a tour to turn into a headache for all concerned, put 2 brothers/sisters on the same kayak and watch them fight. It’s a recipe for disaster. The only way 2 people in a double kayak enjoy the experience is if both paddle at the same time with the same rhythm. So please parents, don’t even ask. We refuse to put siblings on the same kayak. (You’ll thank us later hehe). 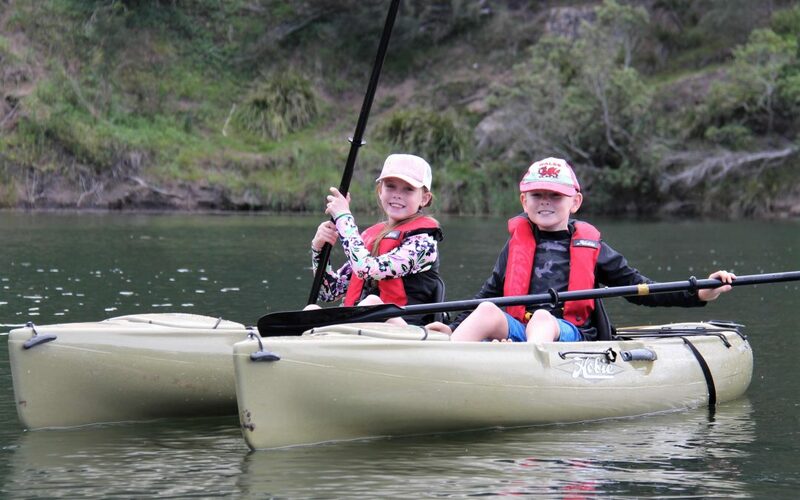 if they are tiny little 7-8 year olds, they are still able to paddle a single kayak – we just tow them along and they then learn by following the guide. They actually end up being better paddlers if they copy a good paddler’s technique. even teenagers who are dragged out of bed early for a tour end up loving it. They love the freedom and being ‘in control’ of their own boat. We do have – and use – a double kayak. But only for children aged 4 to 7 years (depending on size) with an accompanying adult in control…. If YOU are a little worried about your own ability, keep it to yourself. Act casual (if you can) and PLEASE don’t say things like “it’s okay, you’ll be fine” – you are just transferring your own fear onto your child. This immediately suggests to a child that they about to do something dangerous. Kids pick up on the vibe very quickly and if they are young, it’s even more obvious. Kids who bounce out of the car excitedly don’t need mum or dad dampening their enthusiasm by suggesting they are about to do something scary. It’s not scary. It’s not dangerous. It’s new and exciting. Let the trained guide do their job. Yes of course, keep an eye on things and listen in – but our guides are very experienced in picking up on a new paddler’s trepidation. We can tell immediately if a kid is a little over-confident, or if they are nervous and don’t want to show the rest of their mates/siblings/cousins/parents. Each paddler is spoken to one-on-one and we will judge their ability very quickly. We don’t make it obvious if we think one of our guests is nervous (except to the other guides). We are professionals and proud of it. Trust us – we have taken so many personalities, ages and abilities on our tours that nothing surprises us anymore! It’s only a couple of weeks before school goes back. Your kids want something ‘new’ to do and by now they are sick of playing with what they got for Christmas. enjoy a wonderful and bonding experience for the whole family – a rarity these days. Book here now or give us a call 0429 961047.